Mother’s Day is quickly approaching! This year, give the special women in your life a handmade aromatherapy gift. Whether the mother in your life currently uses essential oils or not, she may love to keep a wonderful aroma around her with these personal diffuser pendants. And, even if she isn’t a jewelry person, you can give her a pendant diffuser that she can hang in her bathroom or closet instead! When you are finished making these cute little diffusers, just add a drop of your favorite essential oil and allow the oil to soak in before wearing. Then enjoy the scent for 1–2 days. Once the scent fades, simply add another drop of oil. If you are gifting this to someone who doesn’t have essential oils, you can give them some in a little sample bottle so they can use this pendant diffuser right away. Lay out a section of wax paper on a table to create your work station. This will help with cleanup and make it easier to roll out the clay and move the pieces. Roll out the clay on the wax paper. You want it about 1/8–1/4 inch for pendants smaller than 1 1/4 inches. If you are creating larger pendant diffusers for a small room, you may want it to be thicker so it doesn’t break as easily. Use your cutout object to cut out the pendants. With the remaining clay, you can form beads by rolling it into small pieces and poking a hole through them with the chopstick or other stick. 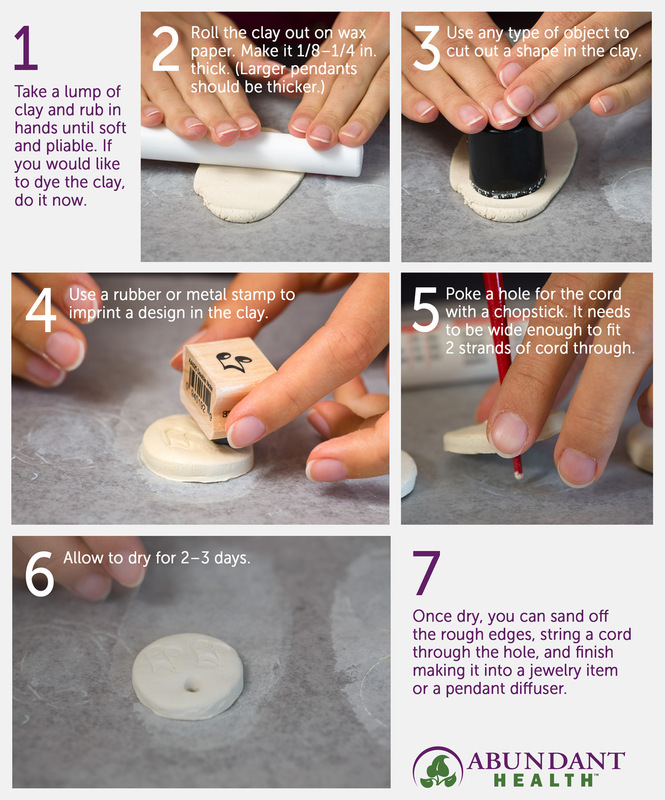 Stamp your design on the pendants, and poke a hole through each of them for the cord with the chopstick or other stick. Transfer pendants and beads to a paper plate, and allow them to air dry for 2–3 days. Once dry, you can sand rough edges with sandpaper, decorate with paint, and/or finish making them into a piece of jewelry. When figuring out the length of cord you will need, position the cord around the wrist or neck to the length you desire. Then cut double the length you think you will need. (You can always cut more off if it ends up being too long. We have found that adding any beads or knots takes up more string than you think it will). Put the ends together, creating a loop at the other end. String the pendant through the loop and the cut ends through the loop, securing the pendant in the middle before adding any beads. To use, simply place a drop of essential oil on the pendant, and rub the oil around. After a minute, the clay should have soaked up the oil and begun to diffuse. Reapply oil as the scent fades. I love doing simple projects that can be given as a gift the a small sample and allow the to buy the next oil themselves!